UK education ministers have said that by 2012 they want a system in which students apply for university places after receiving their exam results. But both the government's options for changing the applications process were rejected in its consultation and there are doubts it will ever happen. The issue of post-qualification applications (PQA) is "difficult and often contentious", it acknowledges. Nevertheless ministers argue change is needed to make the process fairer. At present most students apply to university and are offered conditional places on the basis of their predicted exam results. Admissions service statistics suggest 55% of these predictions are wrong, the government says - mostly over-estimates. About 9%, it says, under-estimate how well youngsters will do, a problem affecting poorer students the most. A report last year by the director-general for higher education, Sir Alan Wilson, proposed two options. One was to have no places being offered until exam results were known. A second, hybrid option would involve having conditional offers as now, though based on students' prior academic records rather than predictions. But all universities would have to leave a number of places - he suggested 15% - for people to apply for once they knew their results. The response published on Monday shows that on the first option, 15% were in favour, 68% against and 17% not sure. The second found favour with 24%, while 53% were opposed and 23% unsure. Nevertheless the government says there was "very strong support in principle" for post-qualification applications (PQA) before and during the consultation - which had 190 responses, mostly from the higher education sector itself. So what ministers have proposed is a two-phase process. By 2008 - "crucially" - they want students who get higher exam grades than required to meet their conditional offer to have the chance to seek an alternative place. Such applications should be considered alongside those from the "near misses" - candidates who did not get the grades for their first firm conditional offer but still hoped to take it up. They should be considered before the start of Clearing - the process which tries to match up people without offers and universities with spare places. The government suggests doing this in a "post-qualification adjustment period" in the time freed up by moving forward the publication of exam results - at least one week. Further details are to be worked out by a "delivery partnership" of universities, colleges, schools and others. The system would be reviewed in 2010-11. 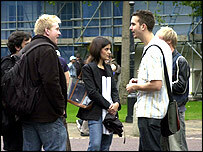 England's Higher Education Minister Bill Rammell said: "Nobody is pretending it's going to be easy. "But we've worked very hard for some months to achieve the agreement of the education sector to introduce these reforms and to aim to introduce PQA in 2012, and we anticipate a sufficient level of momentum to carry this forward." John Dunford of the Association of School and College Leaders, a strong advocate of PQA, has his doubts. He said universities had been "very resistant" to it in the 10 years in which he had been involved in the discussions. Asked whether he thought it would happen, he said: "I think it's very unlikely because the universities hold the cards in their hands." The vice-chancellors' group Universities UK said: "We remain committed to the principles behind PQA but we all recognise that PQA is not going to happen overnight." the timing not being detrimental to international applications. Shadow higher education minister Boris Johnson said: "Of course we should have post-qualification entry." But, he added, "This reform is a muddle, and is likely to add to the burdens on teachers and universities. "It is another example of government trying to micro-manage admissions procedures that should be left to the universities themselves." Unusually for an education announcement this was UK-wide. But the government says that because of the different system in Scotland, for many (around 70%), PQA is already a reality there so the case for significant change may be "less compelling". "Scottish ministers will take fully into account the particular circumstances and requirements of Scottish education before deciding whether any further changes beyond those proposed in this response are required in future."